Here at the Stock Brun Berhaut household, Christmas is our favorite time of year. 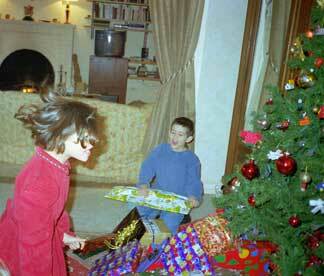 On the left, it's dinner time on Christmas Eve 1996 at La Bellanderie. 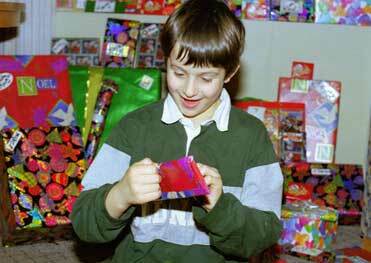 Alex was not yet a gleam in his father's eye. Within six months we had married and moved to Santa Cruz! 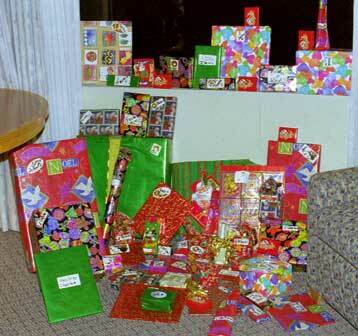 Busy year, 1997. 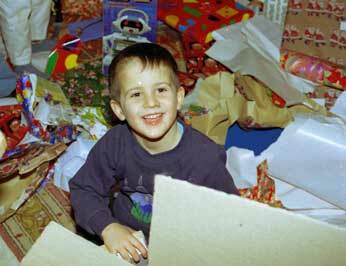 Perhaps the real meaning of Christmas can go astray at times . . . .
. . . . or maybe happy children is the real meaning of Christmas? "Joy to the world, all the boys and girls!!!" Three Dog Night. 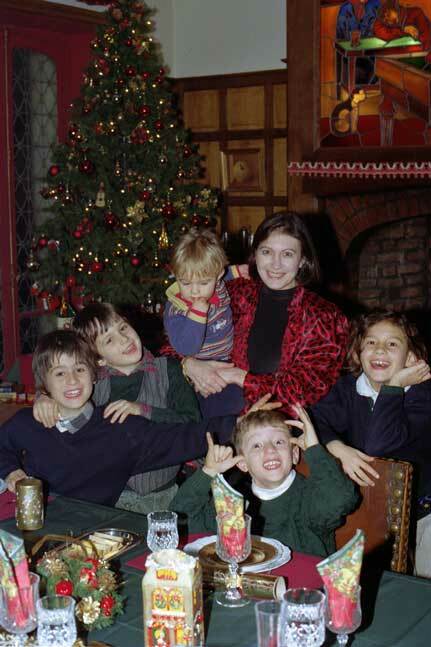 Above, Alban in 1994 au Tahu and Daphné and Nick also in 1994. 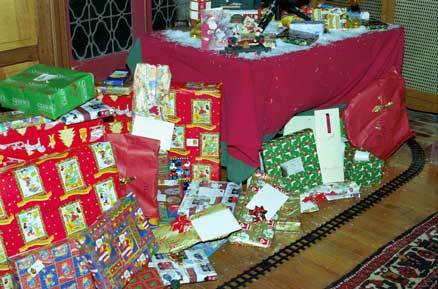 Presents is the theme! 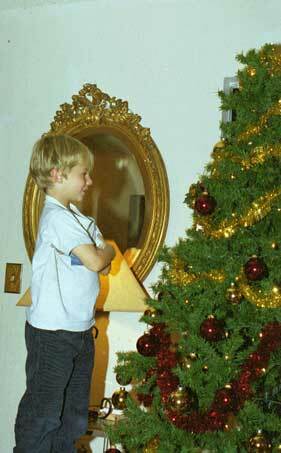 Maman and Alexander decorating the tree in 2001, and below Charles approving the results in 2000. 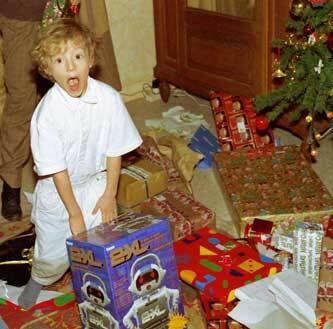 Decorating the tree happens in our household on November 26, Mamie Régine's birthday. She is no longer with us, and neither Charlie nor Alex ever knew her, but on her birthday we try to decorate the tree and the house. 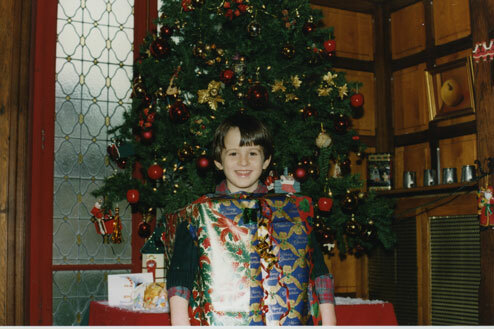 and below disguised as a Christmas present, 1996. 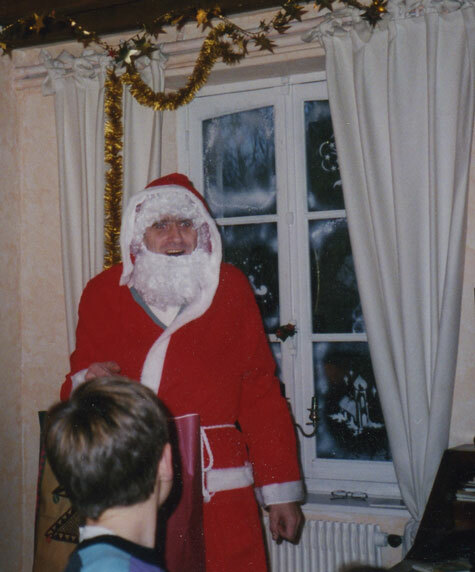 Finally, here on the left is Father Christmas himself, in Le Tahu in 1994. None of the children recognized him! 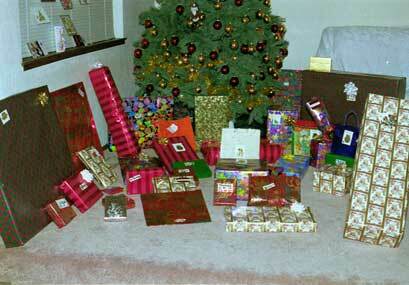 Other special days: later Christmases, Halloween, our wedding, children's parties, Thanksgiving 2005. Other vacations: La Grée, St Malo, New York City, Florida, Vancouver, Yosemite, Brocéliande, Marlow, Death Valley, Thorpe Park, Road Trip.